New Brunswick, founded in 1681, developed as a major shipping and stagecoach center by the mid-1750s. The cargo carried to and from New Brunswick via steamships and the Camden and Amboy Railroad shaped the development of the city and the state far more than many realize. Timothy Regan’s new photographic history of New Brunswick chronicles the city’s development from the late nineteenth through the early twentieth century, and uncovers its role in the development of New Jersey. Vintage images of long-forgotten hotels, taverns, and houses are featured in Mr. Regan’s work, many of which were built in response to the growth of the city’s shipping industry. New Brunswick is significant historically in the field of education as well; the evolution of Rutgers College―chartered as Queens College in 1766 by King George III of England―is covered in this volume. Also included are images of notable early residents, including poet and renown journalist Joyce Kilmer. Timothy Regan is a Somerset County park ranger and author of Keyport in the Images of America book series. 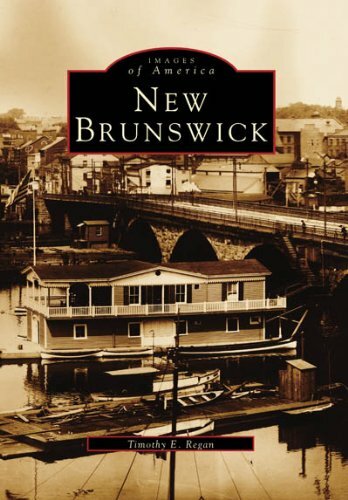 His affection for the area and knowledge of its history are evident in this remarkable tribute to the city and the people of New Brunswick.